You may click on names of each of the services to know more about them. Alternatively, brief details of each of the services is provided below. This premium service has been commenced as an information source for the investors who wish to know about the stocks that I am buying currently or the stocks that I have sold recently. This is purely an information source and services like advising individual clients on portfolio allocation etc. is not a part of this service.My stock portfolio has its origins in August 2011, when I invested my initial savings from my first job after MBA (2009-11). I have been able to invest in some of the fundamentally good stocks at the initial stage of their growth phase, which were later on discovered by research/brokerage houses and witnessed investments from institutional investors. The recognition of stocks by key market players have helped to generate significant gains for the portfolio as the underlying stocks got rerated and increased in value. A few such examples are: Ambika Cotton Mills Limited, Vinati Organics Limited, Mayur Uniquoters Limited etc. I started investing in Ambika Cotton Mills Limited in September 2014, when it was trading at very low valuation levels. The stock was later on identified by the well-known value investor Prof. Sanjay Bakshi, who invested in it through his fund “ValueQuest India Moat Fund Ltd” in March 2015. Similarly, other stocks like Vinati Organics Limited and Mayur Uniquoters witnessed increased FII buying and thereby generated good returns by increase in share price. The increased FII buying led to the P/E ratio of Mayur Uniquoters increasing from 6.6 to above 30 and P/E ratio of Vinati Organics increasing from 7.7 to above 20. This increase in valuations led to significant increase in the contribution of these stocks in the portfolio returns. During FY2018, the portfolio has generated returns of 12.66% against an increase in BSE Sensex of 11.34%. During FY2018, We had a total of 51 transactions in the portfolio. All of these transactions were buy transactions and we did not sell any stock during FY2018. Update by email about all the future transactions (buy as well as sell) in my portfolio at the end of the day of the transaction (after market closing hours) during the period of the subscription. 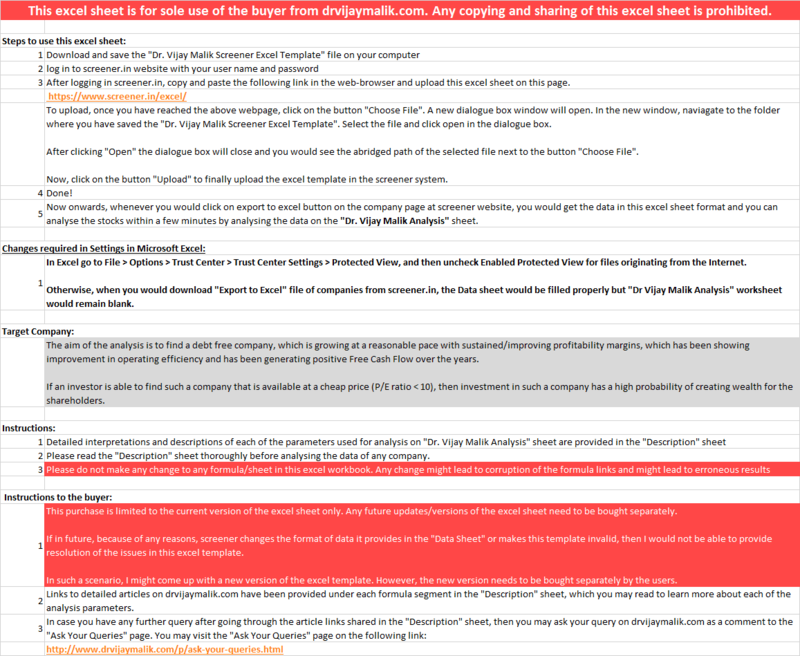 The email update would contain the details of the stock bought/sold and the price at which the transaction was done. “Follow My Portfolio” service is an information service and not an advisory service. In it we intimate subscribers about our portfolio allocation and transactions. We are not able to provide portfolio advisory, portfolio allocation and creation, stock selection, stock buying targets, selling targets etc as part of “Follow My Portfolio” Service. This premium service has been commenced as an information source for the investors who wish to know about the stocks that I am buying currently or the stocks that I have sold recently. The key essence to focus is that “Follow My Portfolio” service is an information service and not an advisory service. In it we intimate subscribers about our portfolio allocation and transactions. We are not able to provide portfolio advisory, portfolio allocation and creation, stock selection, stock buying targets, selling targets etc as part of “Follow My Portfolio” Service. The intimation to investors would always be after closing of the market hours on the day on which I have done any buy/sell transaction. There is no provision of any research report/recommendation note to be published/made available to investors as this service is to provide a glimpse to the investors into my personal portfolio management and related actions. For more details, please read the answers to the frequently asked question (FAQs) below. 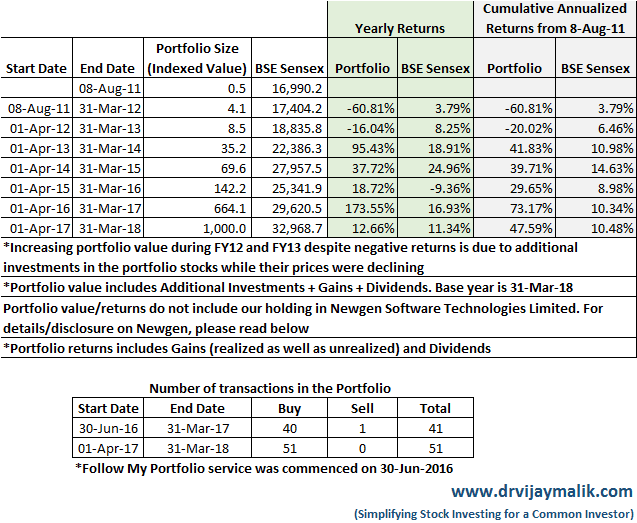 This service has been designed to act as an information source to subscribers about the composition of my portfolio and the stocks that I am buying/selling currently. This is purely an information source and services like advising individual clients on portfolio allocation etc. is not a part of this service. I would not be able to provide responses to questions about specific stocks in the portfolio and specific buy/sell decisions. This service does not include intimating the subscribers in advance about the buy/sell decisions that I would take about specific stocks. This is a subscription service. The access to premium features of this service would lapse after subscription period gets over unless the renewal is done. Please take note that “Follow My Portfolio” service is an information service and not a investment/portfolio advisory service. This service allows access to the page “Workshop on Demand” containing the videos of full-day fundamental investing workshop elaborating our stock analysis approach “Peaceful Investing”. The workshop covers all the aspects of stock investing like how to shortlist and analyse stocks in detail, which stocks to buy, what price to pay, how many stocks to buy, how to monitor the stocks, when to sell a stock etc. The workshop focuses on key concepts needed for stock analysis both for a beginner and seasoned stock investor using live companies as examples. To allow the investors across the world to watch the complete full day “Peaceful Investing” workshop ONLINE on their laptop/mobile phone at any time & place of their convenience at their own pace, as many times as they can, during the period of subscription. To allow an opportunity to past participants of “Peaceful Investing” workshops to revise the workshop and refresh the learning. Subscription to this service provides access to the premium page: “Workshop on Demand“, which contains the videos of the full-day workshop having a total duration of about 9hr:30m. We believe that a person does not need to have an educational background in finance to be a good stock investor and the workshop has been designed keeping this in mind. The workshop explains the financial concepts in simple manner, which are easily understood by investors from non-finance background. 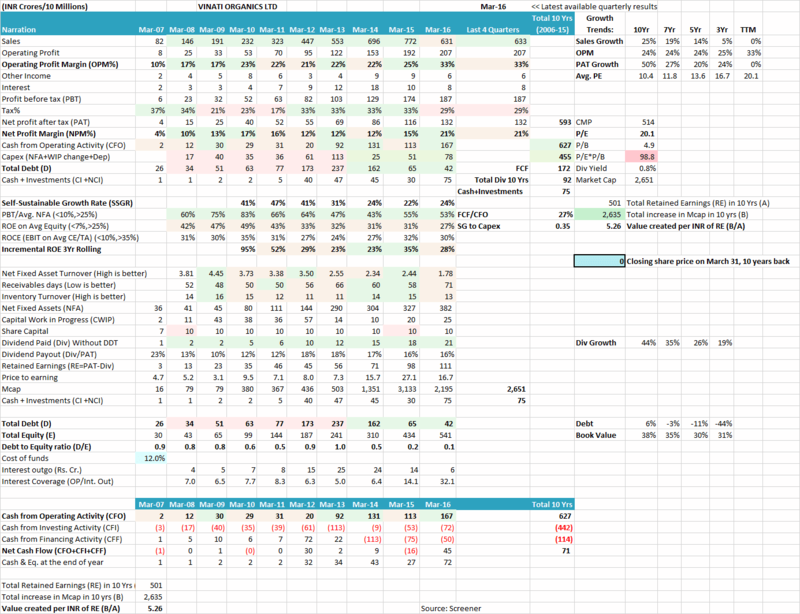 In the past, many readers/investors have asked me to provide the copy of this excel file. However, until now, I have not put the excel template in the public domain for download. I have always advised investors to customize the standard screener excel template as per their own preferences and their learning about stock analysis from different sources. Customization of excel template on her own can be a very good learning exercise for any investor. 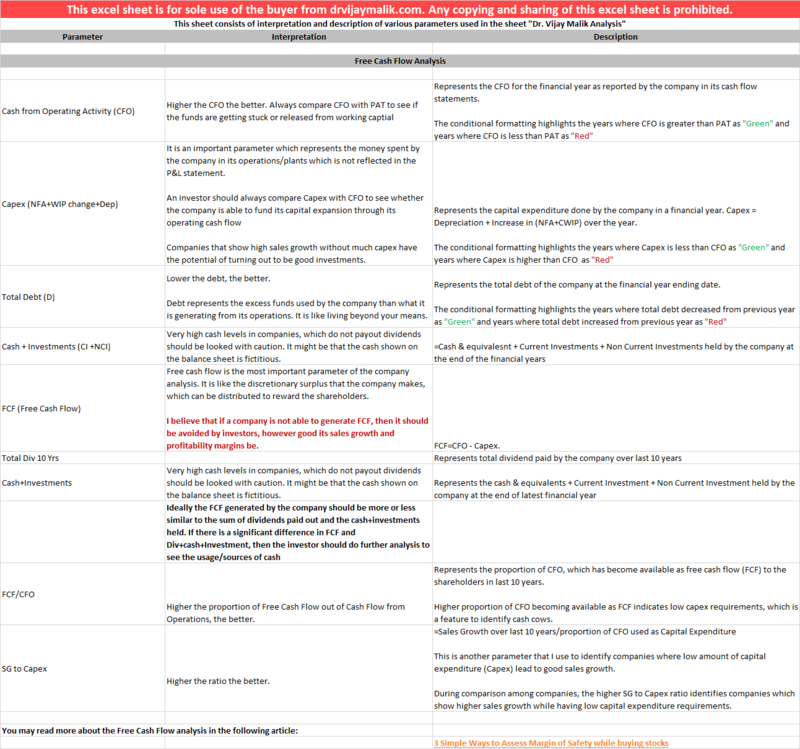 1) Analysis sheet: This sheet presents values of more than 40 key parameters in the form of a dashboard. These parameters cover analysis of profitability, capital structure, valuation, margin of safety, cash flow, creation of wealth, sources of funds, growth rates, return ratios, operating efficiency etc. Having a quick look at these parameters in the form of the dashboard helps in quick assessment about the company, its historical performance and its current state of affairs. The excel template is quite useful. It makes things easy for us in not doing the hard labor and calculating all vital data for each company separately. For further details please read this article: Dr Vijay Malik’s Stock Analysis Excel Template (compatible with Screener.in) P.S: Please read all the instructions on the payment page, carefully before making the purchase of the excel template. Detailed guidelines for conducting in-depth stock analysis covering: financial analysis, valuation analysis, business & industry analysis, management analysis, operating efficiency analysis etc. All these articles are separate write-ups, which are available to all the readers at www.drvijaymalik.com. The key stock investing articles were collected as a book and offered as a key study material guide to each of the participants of all the “Peaceful Investing” workshops being conducted by us. The feedback from the workshop participants about the book has been very good. The readers have found the book very useful to learn stock analysis. 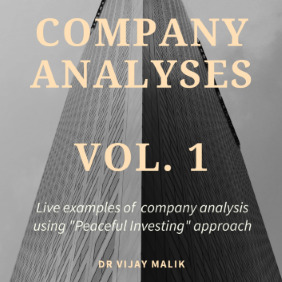 Many other readers of www.drvijaymalik.com have asked for this book to be made available even for the members who have not be able to attend the “Peaceful Investing” workshop. For details of all the articles contained in the book, please read this article. A lot of readers have asked whether there exist e-books compiling all these articles, which could be downloaded by the readers so that the articles could be read in a sequence even when the reader is offline. For more details about this book, please read this article. “Peaceful Investing” workshops are full day workshops (9AM to 6PM) held on selected Sundays. The workshops are focused on stock selection and analysis skills, which would make us much more confident about our stock decisions. It ensures that our faith would not shake with day to day market price fluctuations and we would be able to reap true benefits of stock markets to fulfill our dream of financial independence. The workshops focus on the fundamental stock analysis of stocks with a detailed analysis of various sources of information available to investors like annual reports, quarterly results, credit rating reports and online financial resources. We would commence more premium services going ahead and would update about them at this page. The stock investing articles, stock analysis articles containing my inputs to readers’ analysis and “Ask Your Queries” section would be available free to all the readers/investors.